Born in Ôsaka in 1834. He was the son of the painter Nishikawa Kuniharu and the grandson of the star Kataoka Nizaemon VII. His brothers were Kataoka Gatô II and Kataoka Ichizô III. He started his career in 1840 as a disciple of the actor Mimasu Daigorô IV, who gave him the name of Mimasu Inemaru I. He made a short but quite successful career on the stages in Ôsaka or Kyôto, in ôshibai or hama shibai. He appeared on stage for the last time in the 3rd lunar month of 1858, at the Minamigawa no Shibai, where he played the role of Omiwa in the classic "Imoseyama Onna Teikin". He also played the roles of Sadasuke, Shirai Gonpachi and Banzuiin Chôbê in "Edo Shiire". He unfortunately fell ill and died the 27th of the 4th lunar month of 1858. He was able to play a wide range of roles, either as a tachiyaku or an onnagata. He was said to excel in wagoto and jitsugoto. Dates of birth and death unknown. The first stage name of this Kamigata actor was Onoe Utajaku . He became a disciple of Mimasu Daigorô V in 1864 and received the name of Mimasu Inemaru II. 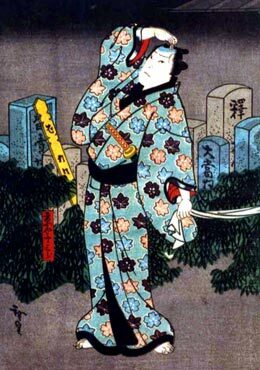 He took the name of Mimasu Baishô in 1867 and was active up to 1884. No record afterwards. Born in Kyôto in 1858. He started his career in 1863 in Ôsaka, becoming at a very young age a disciple of the actor Onoe Shôroku and receiving the names of Onoe Kamesaburô and Onoe Matsunosuke I. He joined the Jitsukawa clan in February 1874, under the patronage of Jitsukawa Yaozô I, taking the name of Jitsukawa Momonosuke. His marriage created a bound to Kataoka Ichizô III, who was the brother of Mimasu Inemaru I. He was allowed to take the name of Mimasu Inemaru III in 1888. He took the name of Mimasu Baishô in Nagoya in 1900. He appeared on stage for the last time, at the Engiza, in July 1901, playing the roles of Samonnosuke and Yahei in the dramas "Fudô Mankichi" and "Takada no Adauchi". He died in Tôkyô the 22nd of August 1901. The actor Ichikawa Komazô held the name of Mimasu Inemaru IV before 1913. Dates of birth and death unknown. Was he a disciple of Mimasu Inemaru IV? His first stage name was Mimasu Ineshô. He received the name of Mimasu Inemaru V in 1912 and was active up to 1924. No record afterwards. His yagô was Kyômasuya. 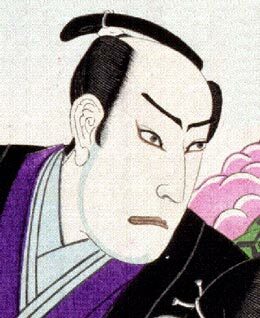 In Nojima Jusaburô's book "Kabuki Jinmei Jiten", his first stage name was Nakamura Utawaka (Utajaku or Kajaku?). In the latest edition (2012) of "Kabuki Haiyû Meiseki Benran", he was named Onoe Utajaku (or Onoe Kajaku?). He was never recorded in Nojima Jusaburô's book "Kabuki Jinmei Jiten" but he was recorded in the latest edition (2012) of "Kabuki Haiyû Meiseki Benran".